A DWGSee browser is a drawing file manager for AutoCAD drawings such as DWG, DXF and DWF. You can quickly view, search, markup, print, compare and share drawing designs, with no advanced CAD expertise required. Option1. 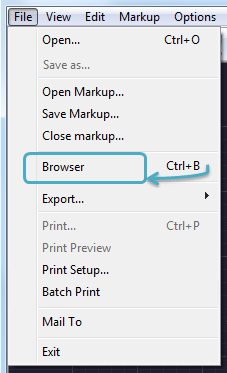 Go to “File” > “Browser”. Option2. Press “Ctrl” and press “B” on your keyboard. Option3. Find the “Browser” button on the toolbar. 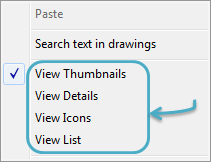 DWGSee allows browsing the local directory hierarchy – you may select folders in the file browser window and it will list all the drawing files in the right viewer. 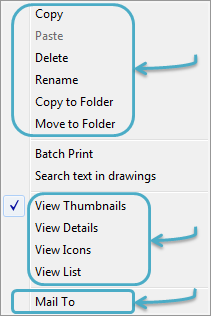 To manage the files in the view, you may right click on any drawing thumbnail or anywhere in the viewer to check the available operations. It allows browsing in different views, which differ in their usage of icons. Files can also be viewed, copied, moved, deleted, renamed or send as email attachment.